Nigeria’s general election is barely one year to go, in this piece, Ikechukwu Okaforadi, analyses the significant role which political alliance by likeminded parties will play in determining the winners and losers in the horse-trade, which is becoming hypertensive this time around. Unfolding political events across the country have indicated that 2019 general election will certainly mark a watershed in the political evolution of Nigeria. Pundits have aptly described the forth coming election as a make or break democratic exercise which will usher in a new social equation in the country. The dawn of electoral victory three years ago to All Progressives Congress (APC), when juxtaposed with recent coalition arrangements in countries like Germany, Liberia, Russia, The Gambia, to form government, brings a revelation on how well thought out political alliance can consolidate ruling party or upstage a nonperforming government. It is evident that despite the victory of APC in 2015, the merger of four parties (APGA, ANPP, CPC, ACN), and later nPDP, to form APC, introduced and exposed some inherent challenges in this kind of arrangement, which even threatened the government at formation. Infighting, battle for supremacy, and sabotage were witnessed shortly after the government was formed by the victorious APC. The remnants still linger today in both the party leadership structure and among party lawmakers at the National Assembly, even at state levels of both party and government. With these shortcomings of merger in view, analysts have explained that politicians, especially those in the opposition, may not wish to go into such arrangement again, but will be more disposed to adopting a different posture such as Alliance between political parties. While opposition parties will ally with friendly parties and socio-political groups to form a strong force that will oust the ruling All Progressives Congress, the ruling party will also work to consolidate its grip on power by forging alliance with friendly opposition parties to win more votes. Alliance is most likely the way to go in 2019, especially given that the process of collapsing political structures, emblems and characters, to nurture a merger, often involves a tortuous journey. In most cases, it ushers in an unanticipated ego trip and backbiting in the new party, which if not well handled, can put the merger in jeopardy. Again, this ego trip and backbiting were observed in the case of APC, during which founding members and protagonists of the merger left the party out of one grievance or the other. The likes of Tom Ikimi, Attahiru Bafarawa, Ibrahim Shekarau, among others, readily come to mind as instances. Recall that on the heels of last general election, Peoples Democratic Party (PDP) had become a domineering enigma, dictating tone and tempo on the political space. The splits of Congress for Progressive Change (CPC), All Nigeria Peoples Party (ANPP), All Progressives Grand Alliance (APGA), Action Congress of Nigeria (ACN), and a host of other opposition political parties, could hardly muster anything tangible to engender a reasonable impact at successive polls, especially at the center. However, this jinx was broken through a merger which birthed the APC and nurtured it to victory in the 2015 election. Since then, political analysts have postulated that a theory of political collaboration would continue to be exploited by Nigerian political class to achieve victory even in 2019 and beyond. With less than one year down to the polls, politicians seem to be toeing this line of thought. It is certainly not a coincidence that shortly after former President Olusegun Obasanjo wrote an epistle to President Buhari in the first week of February, in which he cautioned him against contesting the 2019 presidential election, another ex-President, Ibrahim Babangida, followed suit in more dramatic manner. In his letter, the former President castigated the APC led federal government for failing Nigerians, citing herdsmen/farmers clashes, kidnapping and hardship across the country, among others. While advocating what he called a third force political party and writing off APC and PDP, Obasanjo called on Nigerians to join the ‘third force’. Though he had resigned publicly his membership of the PDP, he definitely still has staunch lieutenants scattered within the party. Few weeks after his letter to Buhari, Obasanjo launched a quasi-political structure and christened it Coalition for Nigeria Movement (CNM), even though he claimed it is not a political party, the supporters and members are topnotch politicians, especially PDP agents. Those in the CNM are former PDP Governor of Cross River, Donald Duke, and former National Secretary of PDP, Olagunsoye Onyilola, former PDP Deputy Senate President, Ibrahim Mantu, key PDP Board of Trustee members, and other prominent PDP senators from the south south, both past and present. Still pointing to possible alliance between PDP and Obasanjo’s CNM, before the dust raised by the campaign for a third force political party could settle, a political party; Social Democratic Party (SDP), which hitherto was less prominent, emerged from the blues and occupied a prominent place in the political discussions in the country. The party was rebranded and packaged as the anticipated ‘Third Force’ political party as championed by Obasanjo. To further buttress linkages between SDP and Obasanjo’s CNM, key members of the SDP, including Olagunsoye Onyilola, Ibrahim Mantu, even Donald Duke, are members of the Obasanjo’s CNM. In the light of the above, one can argue that SDP is CNM extension. Political pundits have submitted that to make the SDP more formidable and place it on better stead for alliance negotiation with the PDP in 2019, some key members of the PDP had to defect to the SDP on the altar of unfounded claims of internal political crisis. Key PDP members who joined SDP when the party was unveiled in Abuja as a third force were Tunde Adeniran, Godswill Orubebe, Turaki Hassan, Gerry Gana, among others. Some socio-political associations known to be sympathetic to PDP, including Ohaneze Ndigbo, Afenifere, Middle Belt Forum, South South Peoples Assembly led by Edwin Clark, are reported to be supportive of SDP. Pundits are of the opinion that if this alliance is well brokered between SDP and PDP ahead of 2019, the PDP will only work to consolidate its unflinching dominance in the South South, South East and partly North Central, coupled with fractions of votes from North East to neutralize Buhari’s prominence in the north, then SDP will render the clincher with massive votes in the South West. However, on the other hand, the ruling APC appears not ready to leave anything to chance like the PDP did in 2015. Observers have highlighted some subtle moves by the ruling party, which they claim could be activated in 2019 to produce a strong alliance capable of giving it a comfortable lead over PDP and her allied forces. For instance, it is believed by many that APGA is already hobnobbing with the Presidency. 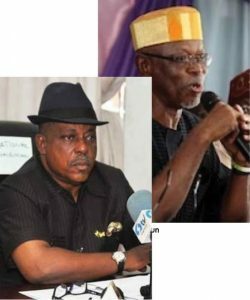 A school of thought believes that APC government at the center traded off Anambra state to APGA by thwarting the PDP efforts to reclaim the state in the last November governorship election held in the state. It is equally claimed by some observers that the senatorial election which brought in Victor Umeh as Anambra Central senator on APGA’s platform, was orchestrated by APC led federal government to ensure that APGA has all the required dominance in the state to deliver APC at the presidential poll. Given the above instances, analysts observe that APC may enter into alliance with few opposition parties like APGA, Accord Party, Labour Party, and others. In this alliance, these opposition parties would benefit from stronger political support from the government at the center to win more of the constituencies within their enclaves at the unit level (governorship, senatorial, federal constituencies, State Assemblies). In turn, these opposition parties will embark on vigorous campaign for the All Progressives Congress at the center and work for it at the grassroots to ensure that it wins the presidential polls landslide. Expectation is that when this is replicated at the areas where these parties have clear dominance in the southern part of the country, the fractions of votes secured in these areas, could be joined to the expected majority for President Muhammadu Buhari in the north and South West to give clear victory to APC in the presidential poll. For instance, the national chairman of APGA, Victor Oye, was recently quoted as saying that his party may adopt Buhari as their Presidential candidate, just as the chairman of Accord, Mohammad Lawal Nalado, in a chat with journalists, made similar remark of possibly adopting Buhari in 2019. Also, the current leadership crisis in Labour Party had been attributed to who will control the party ahead 2019 vis a viz the potentials of the chairman to either surrender the structures to either PDP or APC in the presidential election. From another perspective, the APC might be banking on clear lead in votes from North West, North East, South West and fractions from the south east to retain presidency. From this foregoing, it is evident that APGA would likely strike a deal with the APC government to ally with it to win Imo and Abia states in the South East, on the grounds that it will in turn work with it to win the presidential poll.